These large stars are approximately 22.5" tall. The center is made from the bottom of a recycled wine bottle, the bottom of a vase, or top of an old canning jar [see closeup on right above]. 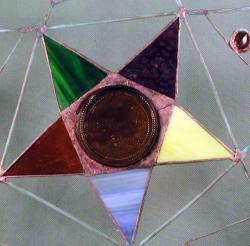 This is surrounded by five stained glass points and heavy copper wire to outline the star. 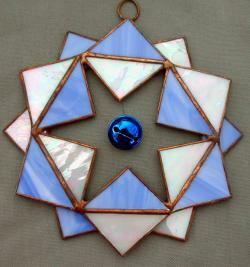 The large portion of the star is twisted copper wire with glass gems on copper wire in each point. 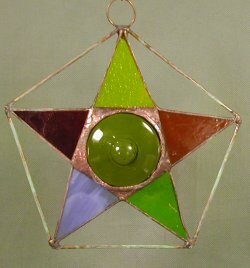 The copper wire of the star has a green verdigris added. Stars can be ordered in the color(s) of your choice. The stars to the left are designed to hang from a small copper wire loop on the top point. They are made exactly like the center of the large stars above. These same stars are available without the hanging loop and mounted on a 30" copper post. They can be ordered in the color(s) of your choice. The triangle stars pictured to the right have a snowflake look as well. 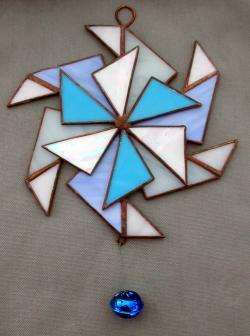 They are made from glass triangles put together in several layers. 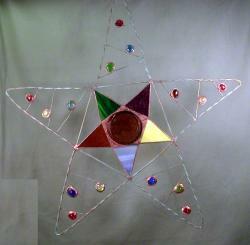 Large stars are $39 each + shipping/handling ranges from $14 to $20. 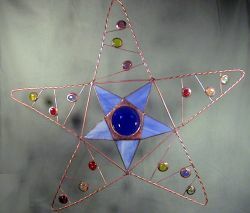 Hanging stars are $28 each + shipping/handling ranges from $10 to $15. 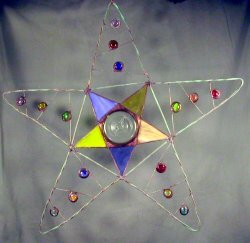 Stars on a garden post are $28 each + shipping/handling ranges from $12 to $18. 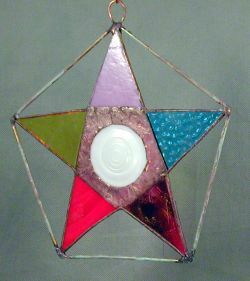 Triangle stars are $35 each + shipping handling ranges from $10 to $15.